This tour of Sicily starts in the island's largest city, colorful and vibrant Palermo, before continuing to the country for scenic drives and island hopping. 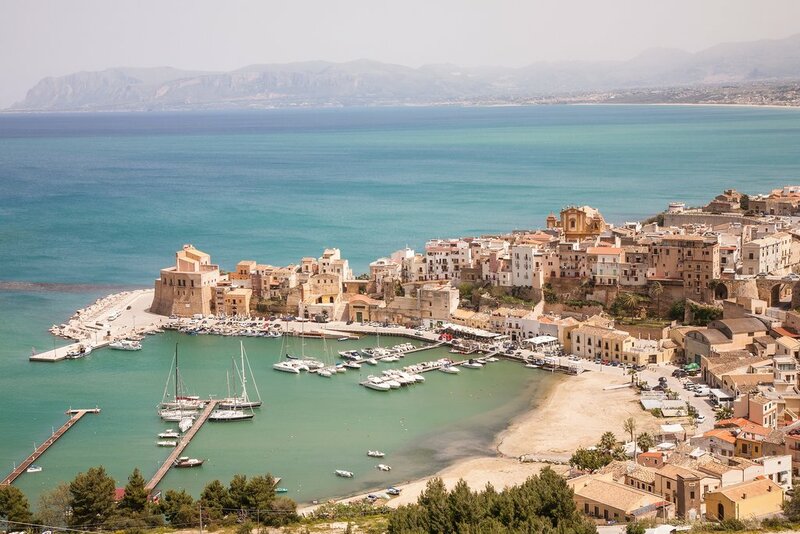 Boat rides, visits to wineries, walks along cobblestone streets and exploration of archaeological sites are just a few of the bucket list items you can tick off on this Sicilian adventure. This itinerary is great for an independent traveler interested in historic sites as well as Sicily's noteworthy wine and culinary creations. It promises to be an incredibly scenic trip, ideal for walkers and hikers. A boat ride to the Egadi Islands will also help to satisfy any visitor's sense of adventure. 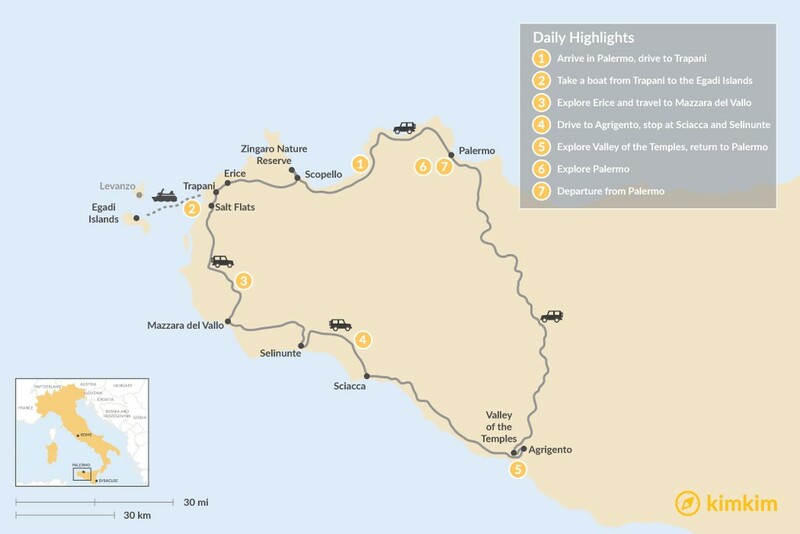 When your flight arrives in Palermo, pick up your rental car and begin driving towards Trapani. As you head west, stop along the way in the Zingaro Nature Reserve, one of the finest national parks in Sicily. The fishing village of Scopello is another fine place for a break. Scopello is a scenic village of smooth white buildings set against a rocky coastline. You might recognize it from the Hollywood blockbuster Ocean's Twelve. It's a historic fishing town with a famous tunnara, a tuna processing plant. 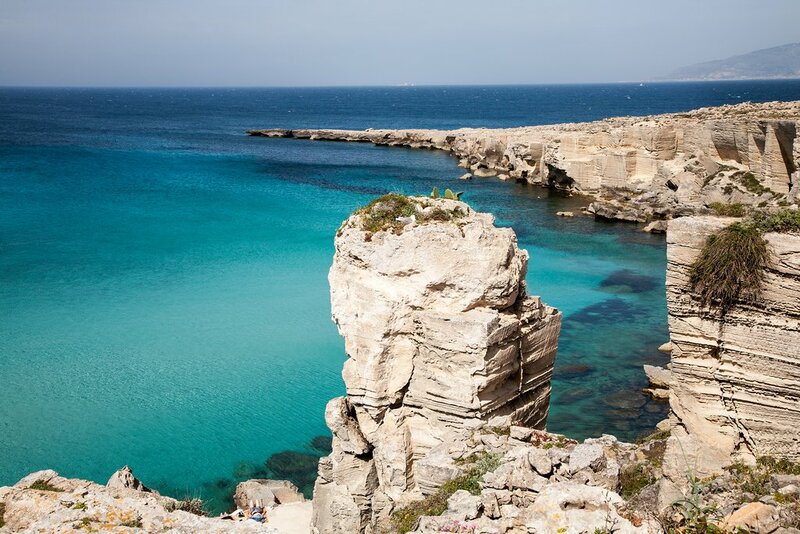 Zingaro Nature Reserve stretches between Scopello on the east, to San Vito Lo Capo on the west. The park is known for its colorful pebble-filled beaches and rocky cliffs that drop dramatically into the Mediterranean Sea. It's widely regarded as one of the most beautiful stretches of coastline in western Sicily. 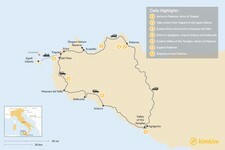 Continue on to Trapani, where you will check into your hotel for the night. The Egadi Islands are a lovely escape. Trapani was an important trading port in the medieval era, but today the sickle-shaped harbor is better known for its walkable Old Town center. The city has been heavily influenced by the various cultures that have played a roll in the history of the city, including rule by Greece, Rome and Byzantium. After getting a feel for the town, charter a boat out to the Egadi Islands. They consist of three main islands and the culture here still reflects an ancient tradition of living off the bounty of the sea, although tourism is outpacing fishing as the primary revenue generator. Highlights include the prehistoric cave drawings located on the island of Levanzo, snorkeling and swimming at the many beaches and coves, and hiking and walking through the island's ports. Return to Trapani for the evening. In the morning, pack up and drive inland towards the famous salt flats, where you will experience a dramatic change in scenery. 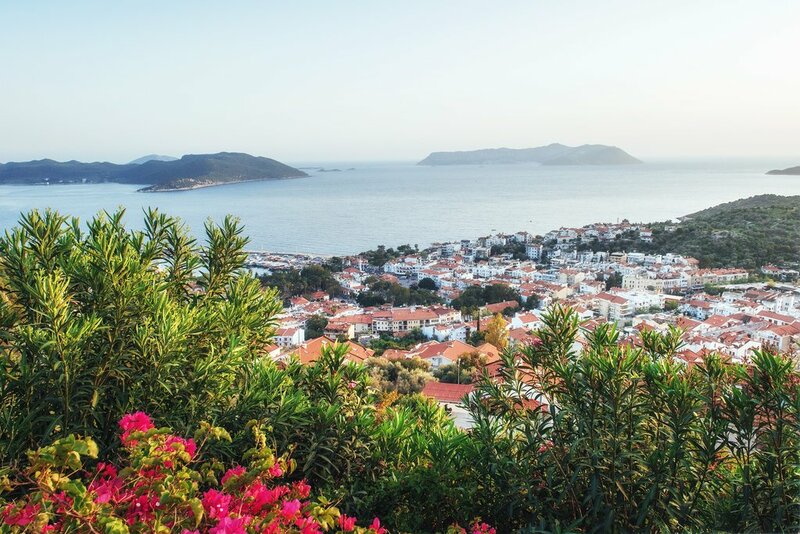 Instead of the turquoise waters of the Mediterranean and rocky shore, you'll see a white-washed landscape studded with terracotta roofs and piles of salt. It's an almost otherworldly beauty well-worth the drive. 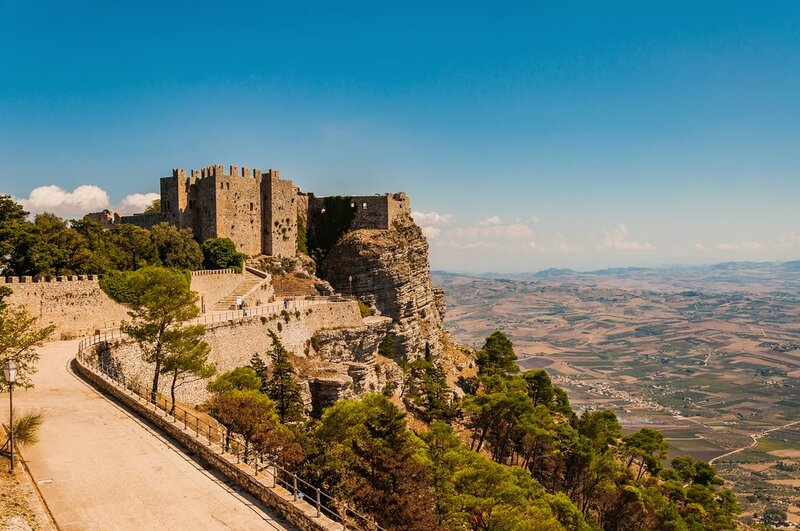 Continue on to Erice, a walled medieval town known for its picturesque views of the sea and surrounding valleys. It also has a reputation as the home-base of the Cult of Venus. Today the town is well-loved for its pastries and other treats. In the afternoon, visit the well-respected wine region of Marsala, which helped put Sicily on the map as one of the world's premier viniculture destinations. Taste your way through the region before continuing on to Mazzara del Vallo, an Arab-influenced old town with incredible architecture. 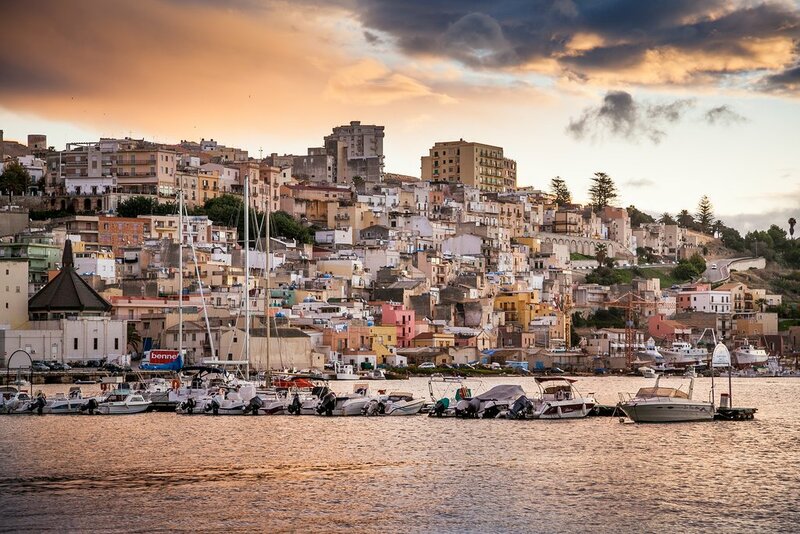 Take your time getting back on the road before continuing on to Sciacca, another medieval town that was historically known for its festivals and a thermal resort that was founded in the 5th century B.C. Check out the Piazza Scandaliato, part of the town center that features a lovely staircase leading to the harbor below. After lunch in Sciacca, continue on to Selinunte to explore ancient Greek ruins and temples. The area surrounding the ancient town is relatively undeveloped, making it easy for visitors to picture what this place looked like in its heyday. It takes about 3-4 hours to walk this massive park, but there is a tram that will take you around its circumference if you are short on time or have mobility concerns. In the evening, continue on to Agrigento, a more modern city with motorways and thoroughfares. Stay in the much more appealing center of town, which is characterized by its medieval architecture and walkable streets. The famed Valley of the Temples is a must-see. Prepare for another day of touring ancient temples on foot. 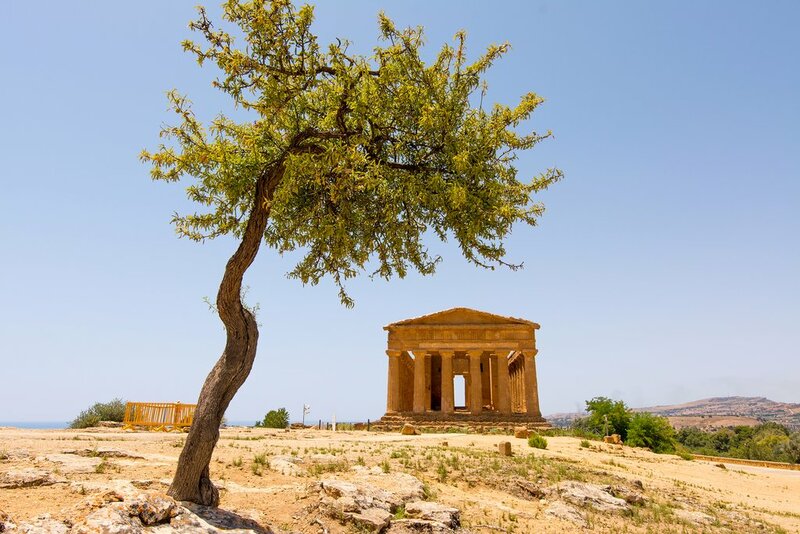 The Valley of the Temples is widely regarded as the most enchanting archeological site in all of Sicily. Highlights include the Temple of Hera on the eastern side of the park and the Temple of Concordia, which is perched on a ridge and once served as a beacon for sailors out at sea. You can take a guided tour of the archeological park if you desire more background information on each structure. Whether you explore on your own or book a tour, take your time exploring these temples. In the late afternoon, drive back to Palermo and settle in for the night. 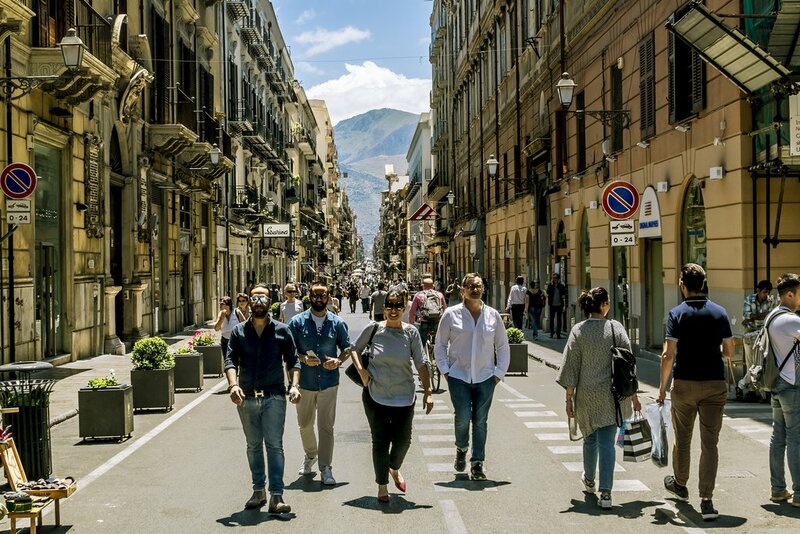 Palermo is a bustling city with plenty of shopping, eating and entertainment options. Palermo is loud, lively, and enthralling. Street vendors sell souvenirs and flavorful foods in the markets, but these are a little tricky to navigate on your own. A local guide can help make this an enjoyable and memorable experience. Enjoy your meals out on the town today, and sample as many local specialties as you can find. You'll have plenty of free time to walk the streets or visit museums and other points of historic interest. When you need to rest, return to your hotel for a relaxing evening. 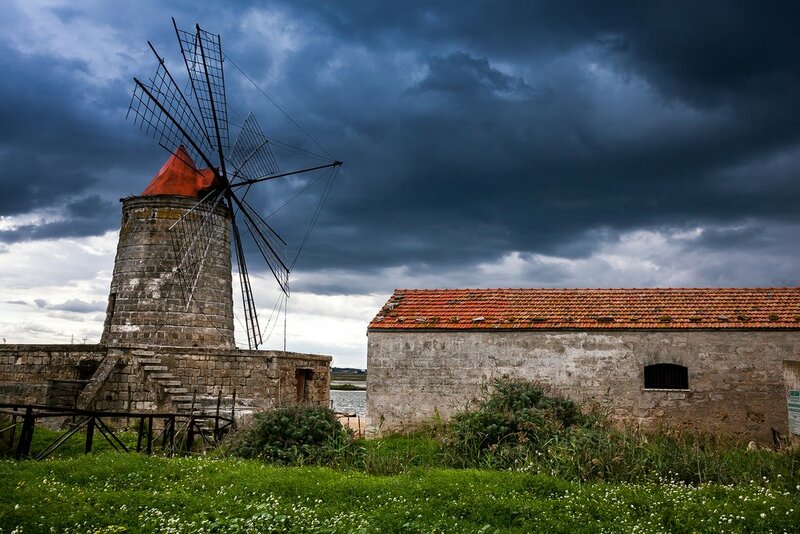 An old windmill and saltwork in the Marsala region. Start the day off with breakfast in Palermo before heading to the airport to say goodbye to Sicily.